Rose Boyt initially wrote Hows Your Father while her own father, Lucian Freud, was alive but rewrote it after his death. 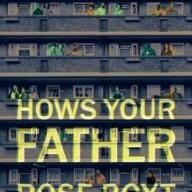 Hows Your Father is the rollicking tale of four generations of a Hackney family as they lurch through a life of fierce love, drugs, booze, crime and poverty. Like Benefits Street without the lurid condescension.